Sadiq Masih had a ready crop of rice and cotton in six acres when one of the worst floods hit his village last year 2014. “We were hoping for big profit as white cotton bolls started sprouting. It was like gold for us”, said Sadiq, 55, sitting on a cot amid cotton plants covered in brown mud. The pile of furniture and steel boxes, containing clothes and wheat flour, lied in a corner of the ground covered by rubble. Sadiq and his family spent more than a month at St. Judes High School of Chak (village) 205 after water levels started rising at his abode. “It was a disturbing morning of August 10. We made at least three mud barriers”, he said pointing to heaps of mud at the ground. “The water kept rising and we fled in neck-deep water”. 15 families took refuge for three weeks at Ibn-E-Mariam Catholic Church of Chak 205 located on higher grounds. Others like Sadiq were adjusted at the neighboring St. Judes School whose kitchen and store room were all occupied by flood affected families. Flood water swamped about 2.4 million acres of crop area in Pakistan recent floods. According to the Ministry of textiles, late monsoon rains and floods in River Chenab dampened the prospects of harvesting a record cotton output in Southern Punjab. 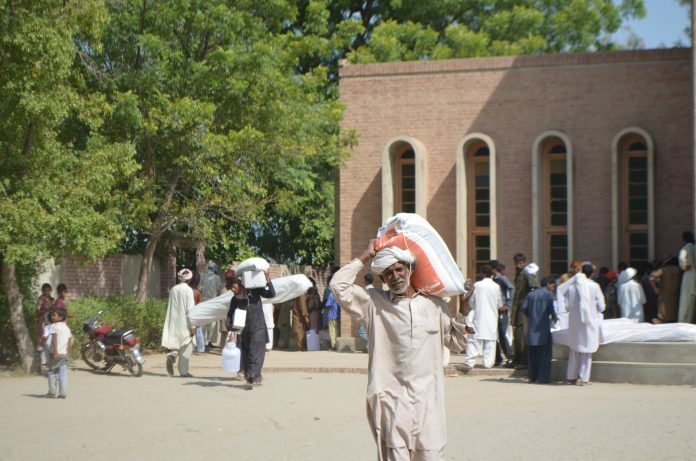 Caritas Pakistan Multan distributed food packages, hygiene kits and tents among 100 families on October 3 in the Parish house of Father Raymond Saeed .A medical camp in the area was held the same month.